Riposto, still early in the season, was not too crowded. Full of people but the marina charge was steep enough at €54 per day. I rang Antonello, whom we hadn't seen since out last visit to Sicily almost two years ago. He and Cristina, with 16 month old son, Milo, came to visit. Their timing was most fortunate as it coincided with a guy from a marine diesel company in nearby Messina, who we were put on to may the marina shipyard. Problem was he did not speak English so it was perfect to have Antonello as interpreter! While we had a drink and catch up chat the mechanic took off the injectors and injection pump from the generator for workshop testing. Next morning we had a short stroll along the shore street, stumbling across the bakery, fresh fruit and veg market as well as the fresh fish market, all of which had a little of our business. By late morning we were ready to check out and motor, on a windless day, a few miles North to an anchorage in Taormina Bay in front of the village of Naxos. Naxos anchorage is most picturesque with the towering Mt Etna, belching out smoke, as a backdrop. Without a generator for at least the weekend we would have to run our main engine to charge batteries. On Sunday we were invited for dinner at Antonello's house close to Naxos, even closer to Edna for one of Antonello's specialities, lasagne washed down with beautiful local wines. On Monday the diesel mechanic and Antonello arrived to reinstall the generator injectors and injector pump. Now Naxos anchorage is not exactly the best protected or calmest spot with an almost constant North swell rolling in making it quite uncomfortable when the boat is side on. Monday was, to some extent, one of those days. Didn't worry Sasha or me but the poor mechanic was soon sweating and decidedly green around the gills. He finished the job and we started the generator, much improved but still not right, putting out black smoke and dying at less than full load. I was not prepared to pay the €600 bill until it was running properly. But, of course, even after much negotiation between Antonello and the mechanics boss, I was left with no option, work had been done! The generator ran until Friday when it just would not start, not even fire at all. It was just as though the engine stop fuel cut off was operated. We checked the stop solenoid, fuel supply etc,etc. Fuel at the injector pump, no fuel at the injectors. Antonello called the diesel mechanic, he would come Monday morning, yer right! With strong South East winds forecast, for safety, we decided it best to go into a marina as the whole of Taormina Bay is open to the East. So off back to Riposto. Now, June, the price had gone up,€75 per day!! We walked the town and waited for the bad weather, nothing happened! On Sunday I decided to some more investigation and take out one of the injectors to test for fuel. I started to undo the fuel return line nut but the whole injector turned and I broke the copper return line. The mechanic had not tightened the screw in injector, it was only finger tight. Great!!! Or words to that effect. On Monday the mechanic couldn't come, surprise, surprise. Antonello came with a friend of his, Roberto, who originally trained as a mechanic. We took off the broken return line completely and Roberto managed to have a guy in the local workshop braze to tube back into the fitting. Back on board we torqued up the injectors properly and put the return line back on, bled the fuel and tried to start. Hey presto, unbelievably it started. Why hadn't it started before? Antonello went off to by seafood at the fish market and we all adjourned to Roberto's girlfriend's house just a couple of blocks away for an absolutely fantastic pasta and seafood lunch in wonderful surroundings and company. Later in the afternoon we off back to the Naxos anchorage. I was still not happy with the generator. It was running but still did not produce full output. One last thing I had not checked, the exhaust elbow, mainly because of the way I had installed the machine the exhaust elbow, where outgoing raw water mixes with exhaust gases, is somewhat difficult to access. I had to dismantle the sound enclosure but found I was able to unbolt the elbow much easier than I thought. Once removed the source of all the generator issues became obvious. The 5 year, 2,300 hour old fitting was almost completely blocked with corroded cast iron and exhaust soot leaving a hole barely 5cm in diameter. It's a wonder it was running at all, the poor thing couldn't breath. In the process of cleaning it I put a hole through the side, it was so corroded so had to conduct a temporary repair with epoxy putty. Put back on and she run just like a new one!! We ordered new elbow along with a number of other spares from the US to be delivered to Antonello's house. I was a very happy little vegemite. Antonello and family came to visit so we motored the 1.5 miles to the other, more Northern, side of the bay, to anchor below the very touristy town of Taormina perched on the mountain 2 to 3 hundred meters above. We swam in lovely clear water, all be it on the cool side, with summer yet to get going. Milo seemed right at home on Ednbal, the movement of the boat not worrying him in the slightest. 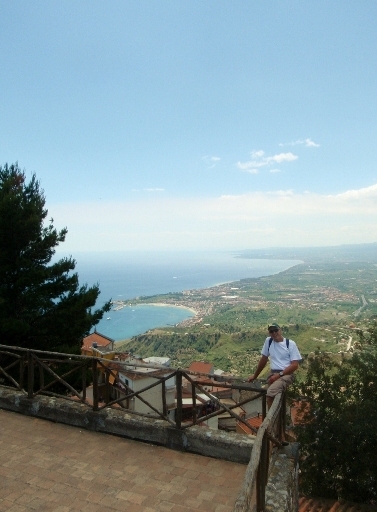 Taormina is one of those must see places in Italy, Sicily. Another day we walked from the Naxos anchorage, with picnic lunch and suitable beverages, along the shore and up the walk path to Taormina. It was packed with tourists and the normal tourist shops selling all sorts of knick knacks. There wonderful views out over the bay and back to Naxos. After strolling around the village we climbed the winding, partly stepped path up to Castel Mola, perched on top of the mountain at 500 metres. From here, even more spectacular views. Most of the "streets" only wide enough for foot or scooter traffic. So nice to be able to walk without traffic. Before we knew where we were our spares shipments had arrived and we had been in the area for 3 weeks so, on 13 June stocked up bulk local wine and other gastronomical delights and with the weather starting to warm up beautifully we decided it was time to head North up through the Messina Straight, separating Sicily from Italy, and into the Tyrrhenian Sea. The forecast was for 10 to 15kt NW winds, perfect to sail out NE course up the 30 or so miles up and through the straight. Like many things, as they say, it's all in the timing. For the Messina straight, about 1.5 miles wide at its narrowest, it is important to time it to have the current of some 3kts going with you rather than against. The pilot book gives current timing for the straight relative to the timing of high tide at Gibraltar. The North going stream starting 1 hour and 45 minutes before high water at Gibraltar. For us on 13 June 2011, around 12.45. We lifted the anchor just before 10:00 and headed out of Taormina Bay. As soon as we cleared the headland we were hit with 15 to 22kt winds from NE, right on the nose, so much for the forecast. With a combination of tacks and then motor sailing close to the shore we made it to Messina by 2pm to pick up the current at about the same time as the wind dropped and swung to NW. In the narrowest part of the straight we were sailing at over 8kts having a current of over 3kts with us. So nice when a plan comes together. The straight is also famous for whirlpools, we had to sail through a couple just for the hell of it! Certainly effected our heading. By late afternoon we were anchored in a somewhat open bay below the village of Scilla on the Italian mainland region of Calabria.